Kelly Speakes-Backman was appointed to the Maryland Public Service Commission by Governor Martin O’Malley, effective September 12, 2011. She also serves as the chair of the Board of Directors of the Regional Greenhouse Gas Initiative, as co-vice chair of the NARUC Committee on Energy Resources and the Environment, and as a member of the EPRI Energy Efficiency & Grid Modernization Public Advisory Group. Commissioner Speakes-Backman has spent 20 years working in energy, sustainability, renewable energy, and environmental business strategies prior to joining the PSC. Her direct technology experience includes power generation from solar, wind, biogas and biomass, distributed generation, natural gas, and fuel cells. 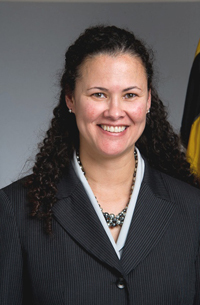 She joined the public service sector in 2010 to serve as the Clean Energy Director at the Maryland Energy Administration, where she led a team of policy experts and grant administrators to implement programs to meet the Administration’s goal of increasing Maryland’s renewable energy portfolio to 20 percent by 2022. Commissioner Speakes-Backman has presented regularly at energy industry events and has authored several articles published in energy trade magazines. She earned a Bachelor of Science degree in mechanical engineering from Boston University.